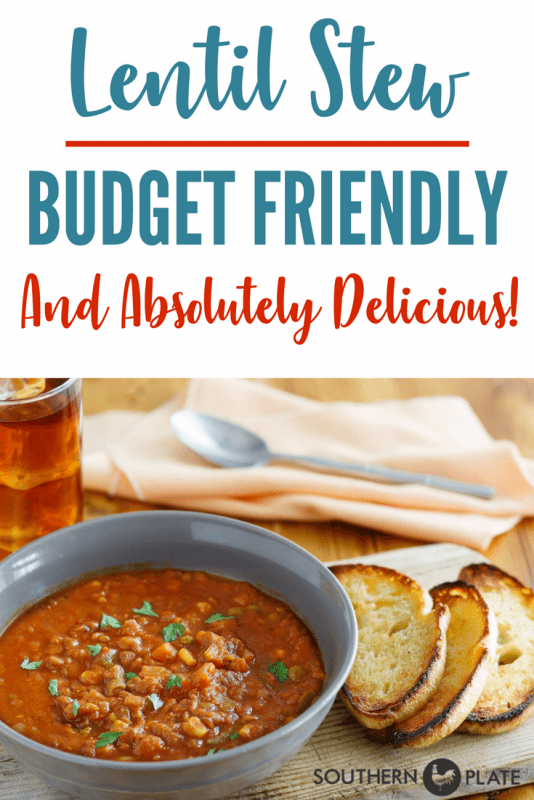 My budget friendly Lentil Stew has a powerful punch of flavor and uses lentils in place of meat for a budget friendly mealtime solution. For those of us who love dried legumes, lentils are the eighth wonder of the world. They are protein rich, inexpensive, hearty and filling, and extremely versatile when it comes to cooking. But what sets them apart from other members of the legume family is the game changer for me – cooking time. Those who are used to cooking other dried legumes are used to overnight soaking, day long cooking times, and lots of waiting around. Dried lentils are a true anomaly because they require no soaking and can be ready to eat in as little as 15 minutes. No, that is not a type-o. But before we get into the recipe, I want to offer special thanks to Ignite Social Media for inviting me to participate in the #LentilsForTheSoul campaign, sponsored by Lentils.org. I really appreciate their support of Southern Plate and am grateful for this special opportunity to bring my love of lentils to you! Although I have been compensated for my work in this post, all opinions are my own. 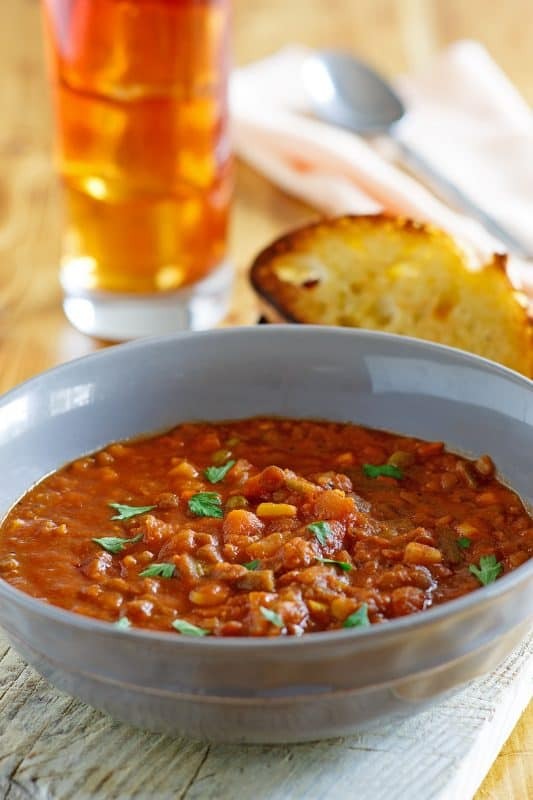 Now let me show you more of why I love lentils and then I’ll share this quick, delicious, and budget friendly stew that even my picky eater enjoyed with zeal. In addition to the nutritional benefits of lentils, they satisfy my Southern need for a “hot bowl of beans”. I like to put on a little chicken broth and cook me up a cup or so of them for a quick lunch. On cold days like today, they are one of my go to comfort foods. Note: There are two primary types of lentils, whole green and split red. Either works fine in this recipe but I have to admit I’m partial to whole green. They will usually just be marked “lentils” in the grocery store and have a pale green color. Split Red lentils are usually marked as “split red”. This meatless stew recipe is what I used to win my family over – and cut my grocery budget in the process. I like to use a few shortcuts in this stew to make it come together in a flash. 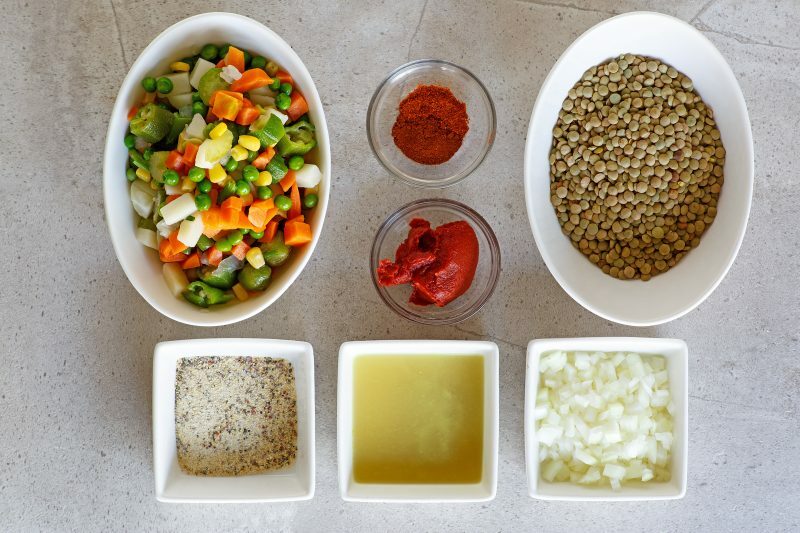 To begin with you’ll need whole green lentils, chicken broth, a bag of frozen vegetable mix (your choice but I like the “soup mix” that has okra in it), tomato paste, small onion, a little cayenne, a little paprika, and an envelope of Italian Dressing Mix for a burst of flavor. Rinse your lentils with water and then place them in a medium sized stockpot and add chicken broth. (Entire recipe along with measurements is at the bottom of this post, as always). 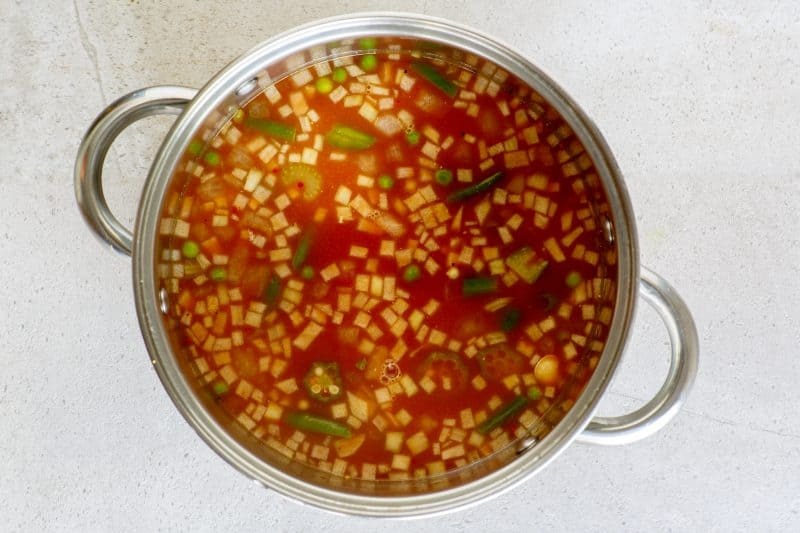 Place this over medium high heat and bring to a boil until lentils are tender, about 15-20 minutes. Add all other ingredients and bring just to a boil again. Reduce heat and continue simmering, stirring from time to time, until veggies are tender and stew is thickened, about thirty minutes. This stew is delicious on it’s own but even better with a side of thick, toasted and buttered bread. I usually make a double batch and freeze individual servings for protein packed lunches later. I hope you get to try out this recipe soon and if you aren’t already familiar with the convenience and flavor of lentils, make it a point to introduce yourself and your family! 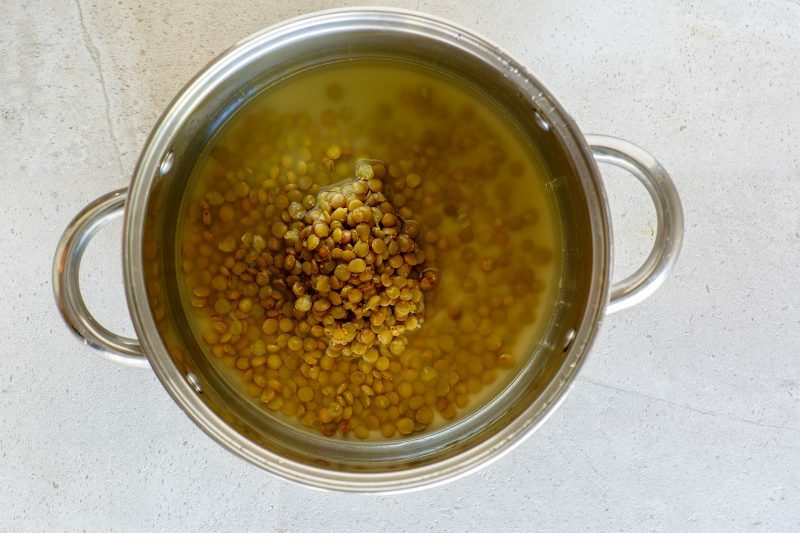 Rinse lentils with water and place in a medium sized stock pot. Add broth and bring just to a boil, then reduce heat and simmer until lentils are tender, about fifteen minutes. Add all other ingredients. Return to a boil, reduce heat again, and simmer until thickened, stirring from time to time. Lentils have so many more uses than this! 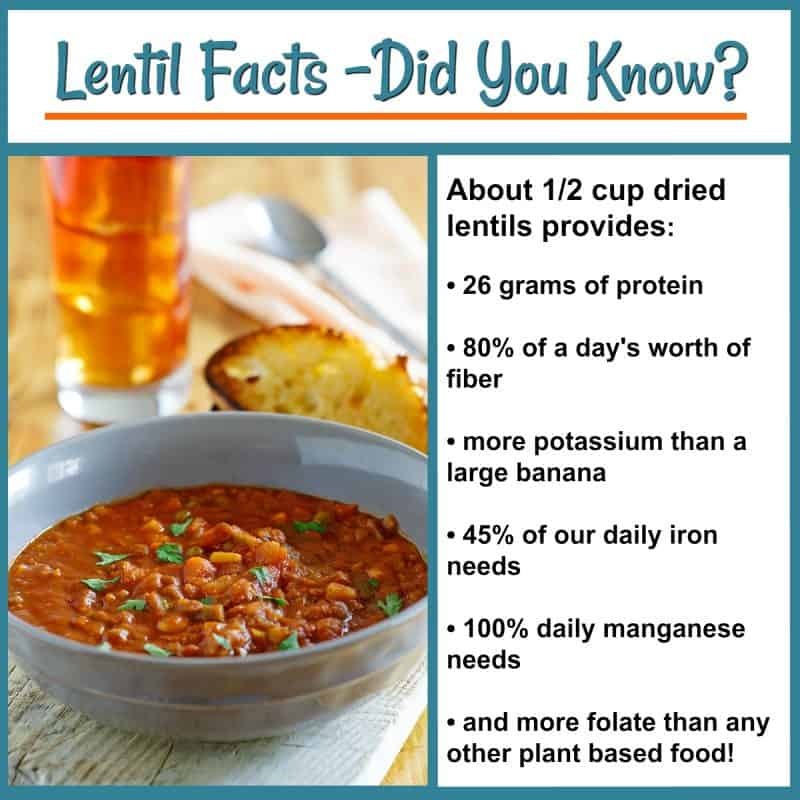 Visit Lentils.org for more great recipes and information. I love lentils too and I am looking forward to trying your recipe. I always trust your recipes because you have “Southern taste”. God bless you today and every day. This looks amazing! I will be trying it soon! Thank you!! I would add about a tablespoon of an herb or herbs of your choice, as well as a wee bit of garlic 🙂 Thank you so much! I can’t wait to try this! My husband can’t eat “acidic” food such as tomatoes. Do you think I can omit the tomato paste or substitute with something else? You could use beef bullion. That is how my German step mom always made them and she added hot dogs, carrots and sometimes vinegar. I know it sounds strange but it was good. Hope this helps. Your recipe also sounds good. I’m definitely going to try it. Thanks! Shirley, I have tried this version and it IS awesome! Great timing for this recipe I just bought 2 bags of red lentils at Aldi’s. If anyone has a Aldi near them they have organic red and green lentils on sale for 2 dollars for a one pound bag. I made a different recipe with lentils last week and it was so good. I am sure this recipe will be just as yummy. I can’t wait to try it. Thanks Christy. I always enjoy all your recipes. That is a good deal, I am going to have to look at my ALDI and see if I can find them there!! Thanks for the tip Anna and I hope you love the Lentil Stew!! I hope you like it Kathi!! I can’t wait to hear back!! Thanks for this tasty , healthful recipie I love lenles. That lentil soup sounds so good,I love soup of any kind. I’m gonna make a pot of it tomorrow. Thank you for the recipe. Can’t wait to try this. It’s 0 points on the new Weight Watchers program! WOW!! REally? I’ve got to look into this now! Christy, I love lentils! But I usually don’t find many recipes for them. … I actually have 3 packages in my cupboard just waiting for a recipe to pop up out of thin air!! LOL And HERE IT IS 😉 thank you so much. It really sounds and looks good. I have to try this. We loved your chicken vegetable stew and your cream of vegetable soup so I know this is going to be another winner. This is the weather for soups and stews. I just discovered lentils and have been trying different recipes so I will definitely be trying this one!!! Oh boy. This one will take some courage… my mom did a lot with lentils when I was a kid, haha! Looks good ! Love lentils. Must try! Thanks! Love the lentils recipe. Do you have the Meditarian version that is yellow in color? We loved this! My 10 year old daughter ate 2 bowls. One question, mine got pretty thick without much broth. Did I over simmer? I may add more chicken broth next time. Thanks for the recipe! Delish! Can fresh veggies be used instead, as well as vegetable broth? I cant see any reason why you couldn’t use fresh, just make sure to adjust your cooking time since it will take a bit longer to cook the fresh ones. I have this simmering on the stove right now. Had a sample taste and it is really good. Planning on having it with cornbread muffins. I like your plan Denise!! I hope you enjoy the stew!! 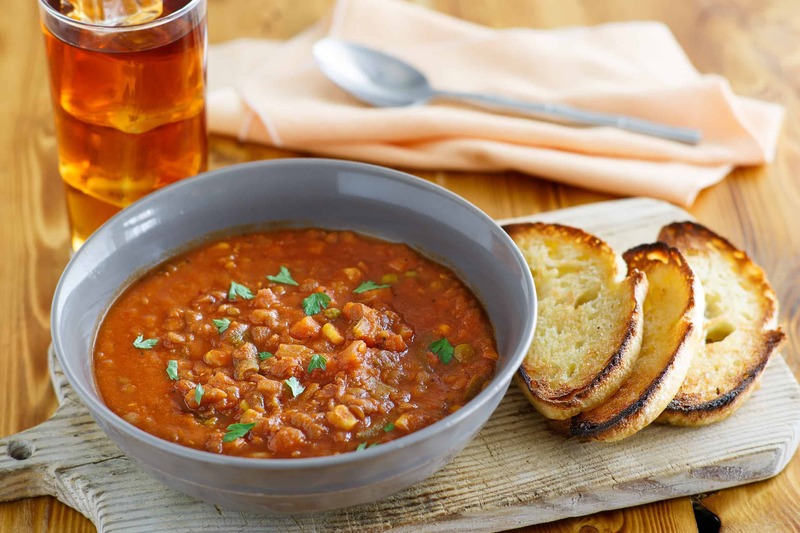 I love lentil soup and I plan to make your version real soon. I have been trying to increase my fiber intake and this soup will fit the bill. I love your blog and I have been following you for many years. Thanks for all your hard work. I live all you down home southern recipes.